Odas (Loft) Classic Penthouse Suite can accommodate up to 3 persons, it is dived into living room area, kitchen, bathroom (Jacuzzi bathtub) and the double bed bedroom at the open loft. Odas Classic Suite is featured as one of the Arcus Luxury Suites & Villas, and located just seven kilometers from Epsikopi, where you will find a beautiful beach. 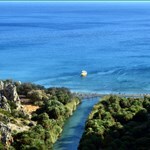 The area is also perfectly situated for excursions and day trips to Chania and to the city of Rethymnon. The Arcus collection of luxury Suites and Villas can be described as an area of old Venetian mansions and town houses set in stone and it dates back to the 14th century. The setting is located in the in the village of Argyroupolis, with the nearest city being Rethymnon. 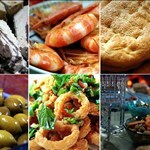 Back in 1983 the area became officially listed and carries therefore a significant importance to Crete and its history. So much so, that the Ministry of Culture announced it as a «Preservable Archaeological Monument». By time the whole surrounding area has been in constant renovation and now you will find 5 beautiful Suites of high end quality, together with a shared pool for guests staying here throughout the year. 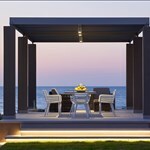 All the properties have been carefully built in line with a traditional Cretan style and architecture. The “Odas Classic Suite”, accommodates 3 guests and is as mentioned available for all seasons. Together with the other suites you will find individual decorated accommodations, all with modern comforts you would expect to find in a boutique hotel. The shared garden area of 400 square meters is provided with a shared pool, a wood oven, a BBQ area and a magnificent relaxation area. Odas (which means Loft in the Cretan dialect) Classic Penthouse Suite can accommodate up to 3 guests and compromises a living room area, kitchen, bathroom with Jacuzzi bathtub and a double bed bedroom with an open loft. The suite has its own private terrace overlooking the garden, the pool and the Cretan sea with Georgioupolis bay from the upper level. It also has access to the garden and the pool. The suite is 57 square meters in size with a further 30 square meters of terrace coverage. Like the other living rooms, Odas is equipped with a 42 inch flat screen TV with satellite; DVD player and sound surround system. The bedroom is also equipped with a 32 inch TVs with satellite receiver and DVD player. A phone line in the living room with voice messaging service is also available for use. Free Wi-Fi and LAN Internet connectivity comes as standard together with a safety deposit box. The kitchen is equipped with an electric oven, dish washer, microwave, coffee maker, kettle, toaster, and fryer. Here you will find all the kitchen accessories to cook yourself a delicious meal or prepare breakfast in the mornings to enjoy on the private terrace. The Odas Suite is like the sister properties, available for all year round stay and is fully air conditioned (individually controlled) and features a large stone fireplace for autumn and winter.